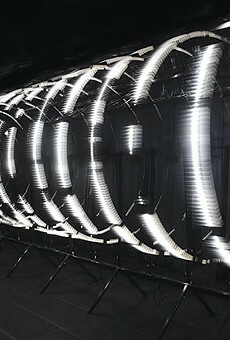 Members of the Dutch art collective Macular have developed four kinetic light installations. Each of the installations deals with the topic of interference within patterns of light and movement. The works are the outcome of the collective’s broader research into the applications of technology and science within art and their perpetual quest to probe the limits of human perception. The exhibition will be an immersive sensorial experience in which the audience can wander about through an abstract world of kinetic light machines.